Please welcome Christine of Bijou and Boheme - one of those blogs you can get lost in page after beautiful page of inspirational photos. She also happens to be midway through a kitchen redesign so I wait with bated breath for that reveal. I'm so curious to hear all about her favorite nook. Let's take a peek. First off, thank you to Stefanie for having me- so honoured!  Brooklyn Limestone was honestly one of the very first design blogs I ever read so to be here now talking about my own home...quite a treat! Trying to determine my favourite nook is a bit of a challenge....I like a lot of spots in my little abode but for now, I think I'll go with this corner of my living room. My house really only has a foyer, kitchen and this great room on the main floor so I actually spend alot of time here. I love this little space because aesthetically, it just completely feels like me. To start with the walls are pink- Behr French Heirloom, to be exact. And ps, I painted the entire room myself so it was a lot of work but I couldn't be happier with how it turned out. Truly, I can't be anything but completely delighted in a room enveloped by this divinely pretty shade. And then there's the actual furniture. The little peak of wood on the right hand side is actually a vintage rosewood credenza that was given to us from my mother-in-law. I adore it because it hides the home theatre business and keeps the migrating play room toys at bay. The wood on it is actually book matched so that when the doors open, the beautiful grain comes together- it's just beyond lovely. Sitting beside this piece actually elevates my mood...it's pretty much a work of art in my eyes. The large mirror is a HomeSense purchase. I've wanted one of these beauties ever since I saw this photo in Style at Home. I love how mine reflects the light from the wall of windows on the opposite side of the room. I also love how I purchased it for a total steal. A little chip in the top right corner (that you ps, couldn't see without a magnifying glass) meant that I paid a grand total of $350 for this pretty...high fives on that one. The nook is really my favourite spot because of the chair. I purchased the vintage Warner Platner beauty on eBay and had it shipped from California. My husband drove down to Buffalo to pick it up from the Grayhound bus terminal and it's been true love every since. It's hard to pick up on camera but the fabric actually has gold thread, which make the chair even more delightful in person. The little cushion is made from vintage Kimono and I love the graphic but feminine punch it provides. I'm not entirely sure what it is about this chair, but really I think it's just that it fits me. When I sit there, I feel totally and utterly comfortable. The rug underneath is IKEA and it grounds the rest of the room with a bold, modern hand. It was actually one of the first things I purchased for the space and I love how it plays agains the more traditional elements. So, there you have it- my favourite nook. If I could change one thing about this spot, it would probably be the lighting. I'd love to add a pair of fabulous lamps to the credenza. Thank you so much to Stefanie for having me!!! Oh- My! The floor mirror is to DIE for!! Absolutely stunning! christine, i am in love with that nook! it is the PERFECT mix of modern and glam that i adore! Completely incredible! I am enthralled by her sense of style! Plus, she's genuinely nice too! Wow- I love that nook, too! Wish it were in my house! I don't think I could convince my boyfriend to paint the walls pink, but I sure do love it! Nice work; you are an amazing decorator! Absolutely so perfect and I can see why you love it, Christine! And Stephanie, this is such a fabulous series, you are having some of my most favorite bloggers...it's so fun to see their homes! Beautiful! And I am so jealous of Christine's steal - the fabulous mirror for $350 - she did good! I am going to try to have a duplicate made while I am living in Peru. Christine is so fabulous. Love her. P.S. Sorry, meant Warner chair. Got distracted with my little one running around with a huge block of cheese! The mirror is from homesense? what a t find. The whole space is just perfect. I knew I would love it! You had me at "Nook" Thanks for the fun! christine, that mirror is STUNNING! Love this series and have enjoyed looking at everyone's favorite "nooks". That mirror is absolutely gorgeous! Stephanie thank you so much for featuring Christine! I love everything about this Nook, from the paint color the fab chair, the striped rug! That credenza, wow! I lwould love to see two lucite lamps on it! You know, I was all set to paint my studio black and white but after seeing that fabulous shade of pink it is back to the drawing board. I'd be mad if you people weren't so damn inspirational! Lovely guest post, I am swooning over the nook!! So happy to have been introduced to your blog. Newest Follower! SO beautiful! I love her blog and her style! Beautiful! I love the pink walls... just gorgeous. I officially want that Rococo mirror, seriously (that is Rococo right)? So wonderful to see Christine here, I adore her blog! Her nook is so delightful and I love her fabulous vintage Warner chair! !